It's Ugly Christmas Sweater Season! They have a lot of really creative ones. I think I would get the Where's Waldo shirt, but I am very indecisive. I think I'd get the Fragile leg lamp sweater for my husband. I think the snowman carrot sweater. The Grinch as Santa sweater is my favorite. I think I would choose the Green Reindeer Sweater. I would get the Elf Buddy Santa I Know Him Ugly Christmas Sweater. I would choose the Meowy Christmas sweater or the Harry Potter sweater. I would pick the rolling stone sweater. I really like the Grinch As Santa Ugly Christmas Sweater! It'd be fun to wear to the movie. 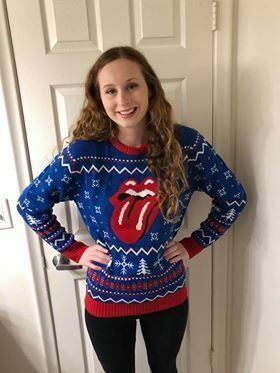 The rolling stones ugly Christmas sweater is the best!!!! I love the I'm Dreaming a Dwight Christmas sweater! I like the My Little Pony Group Sleigh Ride Snowflakes Juniors Navy Sweatshirt. Gotta be the Yeti to Party. And it lights up! I like the papa smurf as Santa ugly sweater! I would choose the Rolling Stones Classic Ugly Sweater. I would pick the Star Wars Darth Vader Mask Ugly Christmas Sweater. Thanks for the chance! I would choose the Ugly Christmas Sweater Wreath with Flashing Lights Cardigan. I would like the Griswold Family Christmas Light Up House Ugly Sweater. I like the rolling stones one! I would choose the Griswold Family Christmas Light Up House Ugly Sweater. I would choose The Fighting Ginjas Ugly Christmas Sweater. Bobs Burgers Louise Appreciate your Lack of Sarcasm Christmas Sweater. I would get the Star Wars Jedi Yoda Dressed As Santa Ugly Christmas Sweater. I love Star Wars and Yoda.